Initiative can produce hidden motivation. You think you are starting a garden from scratch, but as you dig into the soil with your hands, you find old roots. The impulse to create is new, yet at some point, you realize you have broken dirt in this garden before. About five months ago, I posted a tweet using the hashtag #WomenToFollow after reading an article that highlighted not only how much men follow and retweet other men, but also that the same bias holds true for women on social media. When the hashtag began trending, it started a movement to amplify women’s voices on social media. I wrote a blog about it for GenderAvenger. The hashtag has prompted some women, such as Marci Alboher (@heymarci), to check their social media accounts to gauge their followers. When I started writing profiles of different women, I didn’t realize how deeply rooted the topic of gender equality was for me. Interviewing more than a half dozen smart, dynamic women for my #WomenToFollow profiles has enriched my life. In sharing their stories, I have rediscovered my own dreams. After raising four children, two of whom just graduated from high school, a woman’s identity gets complicated: it’s harder to hold onto the impetus that drives one when growing up. For starters, my older brother was always praised for being so smart. My parents encouraged him to attend the Bronx High School of Science. They never asked me if I wanted to attend a selective high school that was a long bus ride from Queens. But I looked to be a leader in my own way. At 10, I founded The Horowitz Family Newspaper. My father, who was a reporter at Variety, had taken me to its newsroom in the theater district (pencils, typewriters, green shades). I ran stories about the family and its Stamp Club and posted wanted ads for my mother asking the kids to clean their rooms. As I always loved writing poems, I created an anthology of my poems on construction paper. My father, who loved to paint and draw, illustrated several of them and framed them. “The wind can be soft and lean / or it can be nasty and mean…”; he used pastels to illustrate the poems and signed them: Rose, Age 12, Dad, Age 12+. My father encouraged me to keep writing. In high school, I earned honorable mention for two poems in the CCNY City-Wide High School Poetry Contest, still an annual event at City College. One poem compared Soviet dissident’s Aleksandr Solzhenitsyn’s exile to the gulag to my sitting at the dentist for a cavity. Slack — I was 16. Fast forward. Not surprisingly, I majored in English and the humanities in college. After graduate school, I worked for the Associated Press in Pittsburgh followed by another short stint in the AP’s Charleston, West Virginia bureau. Later, as a reporter for The Journal of Commerce, owned at the time by Knight-Ridder, I was one of the few women at many events (some examples: speeches by world leaders, international banking conferences, and international trade meetings). There weren’t any other women onboard when I flew on a U.S. Army Black Hawk jet in Florida to trace how smugglers were using commercial flights’ air freight to ship illegal drugs. At the business paper on Wall Street in the mid-1980s, all my editors were men. Several of the reporters were women, but we never discussed salaries or how it seemed more men were offered positions as foreign correspondents. 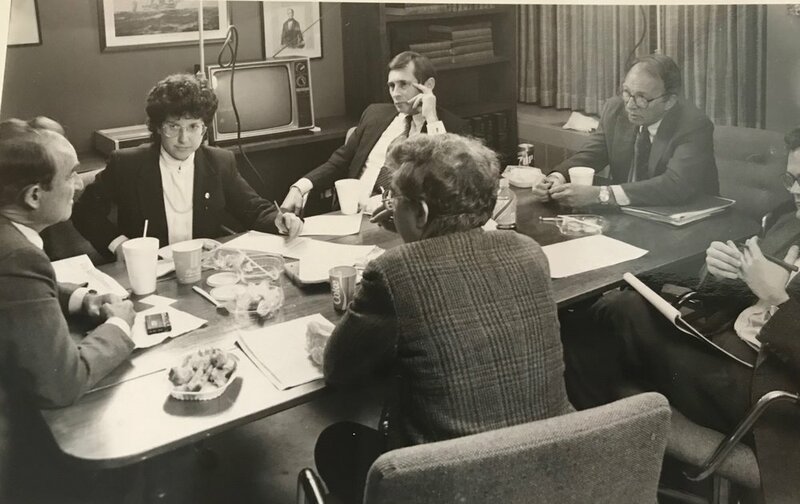 Check out the photo of me interviewing the late Dwayne Andreas, the influential chairman of Archer-Daniels Midland, one of the world’s largest grain processors: I am surrounded by men — the paper’s executive editor, publisher, and department editors. In my case, I was lucky to work for five years at the paper with a terrific editor. He was a Pulitzer-Prize winning journalist who encouraged me to break stories and guided me as I pursued investigative stories, one of which changed legislation in the bidding process for U.S. Food for Peace cargo. In my #WomenToFollow interviews, I heard different stories of how these women started and thrived. Karen Wickre (@kvox) said when she started out in San Francisco as a writer and content developer for tech companies, including Google and Twitter, she “had to learn the ropes myself.” She didn’t cite any mentors other than the example of her mother who worked throughout her childhood. Kelly Hoey (@jkhoey), author, attorney, and business columnist, said her “greatest mentor” was a senior attorney who later verbally harassed her and dated her mother. Amber Osborne (@MissDestructo), a top marketing pro in virtual reality, found her way by necessity and luck: without money, she started posting on social media about eating canned sardines and yams. Her fans wrote to Bruce’s Yams, and the company hired her as their social media manager. In my work as a business reporter for the Los Angeles Daily News, I was one of the few women covering aerospace. I have continued to write for many publications as I have raised my children. With the #MeToo movement in the headlines, it’s been shocking to see the stark brutality of how men continue to dominate with impunity. How has society has let Bill Cosby, Harvey Weinstein, Les Moonves, among many others, get away with it? Recently, while cleaning out our basement, I found a collage I made in high school depicting a scale with men and women having equal weight. Really. When I was 17 and created that collage about women’s equality, I was intent on seeing that goal happen in my lifetime. Certainly, when I became a mother, I thought we’d be further ahead for my daughter (and three sons that followed). There is strength in numbers — more women in many fields — to balance the scale. Here’s my call to action: Keep this Twitter party going — the #WomenToFollow list (curated by my friend, Stacey Kratz (@heykiddo)) is 800 strong. Name three #WomenToFollow. Amplify women’s voices on social media. Reach is key: get dirt under your fingernails as you dig anew to enrich this garden in 2019.